Egyptian veteran blogger Alaa Abdel Fattah has finally been released pending investigation from the Cairo Criminal Court yesterday after being detained for 56 days. He comes home to his family and his 20-day-old son, who was born while his daddy was detained. Cute little Khaled was named after Egypt’s martyr, Khaled Said, who was brutally beaten to death by police informants outside an Internet café in Alexandria on June 6, 2010. Alaa has been detained by military court after refusing to answer any questions directed at him and instead pleading silence as a sign of not recognizing military trials for civilians as legitimate. He knew there would be a price to pay for that. And indeed pay he did. Alaa’s case was finally transferred to a civilian judge recently. That judge yesterday re-started the investigation process, and soon afterwards released Alaa pending investigations. 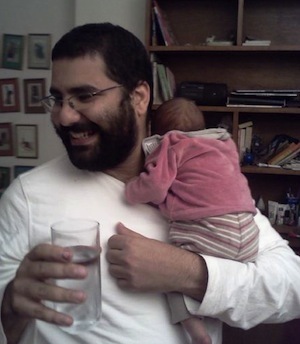 Alaa had to go back to Torah prison, his detention place, for his release orders to be processed. We followed him to Torah, where a while later we were told he was transferred to Cairo Central Security, so we rushed over there. We are now at Cairo central security waiting to see if Alaa will be released from here or from a police station. Hoping to leave with him. Alaa was treated like a celebrity in Tahrir. People rushed at him to say their hellos and hug him. Friends who learned he was free from Twitter joined us in Tahrir. Alaa immediately delved into a passionate impromptu speech about what the revolution means, and what should happen next. Although he kept repeating to his followers that he’s just a foot soldier in the revolution and that he needs time for himself and to be with his family and new born, I was again reminded of why he’s so important to the revolution and why he was such a threat to the military council. Alaa is a natural leader, he posses such charisma, and yet is so true to himself and down to earth that he inspires revolutionaries. People love to be around him, to hear him talk, to listen to whatever he has to say. With great organizational skills added to his qualities, he manages to get people to actually do stuff, to plan things that seem impossible, and to get them done. Or at least to try and keep trying and never lose hope. Hope is the keyword here. And that’s what a leader is about. Alaa is an inspiration. We’re so happy he’s finally free. 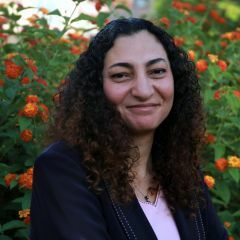 We (myself, a couple of friends, and his family) headed from Tahrir to Alaa’s parents’ house, where he finally had a chance to enjoy his family, his wife activist and blogger Manal Hassan, who endured his absence as her pregnancy was coming to term, and his precious Khaled. And here’s my favorite tweet of all.